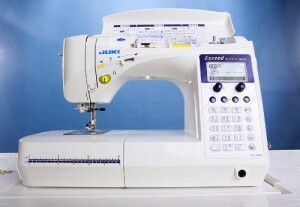 Juki F600 Review - Best Sewing and Quilting Machine Today? Juki doesn’t just make great overlock machines. Not surprisingly, the Juki computerized sewing and quilting machine HZL-F600 model’s claim that it will not disappoint has been proven by thousands of satisfied customers. But that’s getting ahead of ourselves. One of the world’s leading manufacturers of industrial sewing machines today, Juki’s advanced technology provides superior results, amazing features and outstanding reliability all in one great package. This Juki quilting machine is capable of doing a wide range of projects including: garment construction, home décor, heavy duty sewing and of course quilting projects, among others. Don’t be intimidated by the word “industrial” that is used to describe what the Juki f600 can do; it just tells you how much you can depend on this model’s high quality when it comes to the rate, accuracy, and resulting finish of whatever sewing you want or need done. A selection of 255 stitch and sewing patterns can be accessed with the use of the “Direct Select” button. Easily and quickly select stretch stitch, piecing, appliqué, overlocking, blanket stitch, and hemming or adjust them by turning the dial. Stitch settings – as well as patterns and several recommendations for which presser foot to use – are clearly displayed on the LCD screen of the machine. The spacious underarm area on this Juki sewing and quilting machine is complete with a wide extension table with plenty of room for larger-sized projects with room to spare. This is especially important for projects like quilts or ones that require free arm motion like sewing hard to reach areas such as sleeves, hemlines, inside seams, and cuffs. The Box Feed System is a great feature of this sewing machine. The system has an oval motioned feed mechanism and box motion feed dog. These two features together prevent the fabric from shifting positions or shrinking while being worked on. You’ll really notice the quality of this superior system when you work on heavy material like denim or leather. And speaking fabrics, the Juki F600 will have no problem with heavy fabrics, as mentioned, including corduroy, rubber, reptile skin or canvas, among others. This machine has the power to stitch through many layers of fabrics mentioned above. You’ll also be happy to know that shrinkage is guaranteed not to occur when working on lightweight material such as silk, satin, linen or cotton either. Even buttonholes on the Juki HZL-F600 come our flawlessly. This is due to the unique sensor that sews them beautifully regardless of overlapping sections or fabric material. Not only do you have plenty of buttonhole types to choose from – 16 of them – you can now adjust every buttonhole’s cutting width in three easy steps. It is a super easy feature to use and produces amazing results. Variable positions of the needle enable you to move a complete pattern in different places without having to change the width of the stitches. Put the needle anywhere you wish and continue sewing uninterrupted. Save up to 70 of decorative stitches and letterings into entirely new sequences to customize your patterns. Program the needle either into the up or down position, automatically trim the thread after a seam, control the presser foot, change the machine buzzer’s volume, use the built-in sewing guide, switch back and forth to eight various language settings or set the LCD screen’s contrast. I love the versatility of this sewing machine. Raise or lower the Juki HZL-F600’s presser foot conveniently with the knee-lifting built-in lever up to 12 millimeters. You will love this feature when working with quilts. This feature keeps both of our hands free so you can move your project while your knee lifts the presser foot for you. Concentrate fully on what you are sewing and don’t worry about thread trimming. Threads from needle and bobbin can easily be trimmed by pressing the foot control’s heel side. Another trimming option is to use the button designated for this purpose on the machine’s body. I found that once I got used to it, the foot control’s thread cutter was very handy. Automatic tension of bobbin and presser foot can still be adjusted manually. The box feed system performs excellently with a consistent, even pull of fabric. Stitching close to the fabric’s edge is easy with the use of the edge stitching foot. Hemming of jeans and other garments made of heavy fabric is not difficult because the feed dogs (all seven of them) monitor how the fabric should glide over large or thick seams. Stitch length can be controlled by a knob located under its numeric display which also has the knob for indicating the stitch width/needle position. The automatic threader works fine with standard type needles but it apparently does not work with Microtex sharps that need to be threaded manually using Microtex. Pre-settings did not work automatically for some users. The Juki HZL-F600 does almost everything perfectly. No matter what I threw at it, this machine shined. If you work with heavy fabrics, quilt or just want a powerful sewing machine, then this machine is an awesome choice. It really is a good value for your money. If you do purchase this model, consider it an investment. You’ll be using it for years and will likely pass it down to your young ones when you ready to retire from sewing. One other thing you can hang your hat on is the reviews are consistently outstanding for this quilting machine. 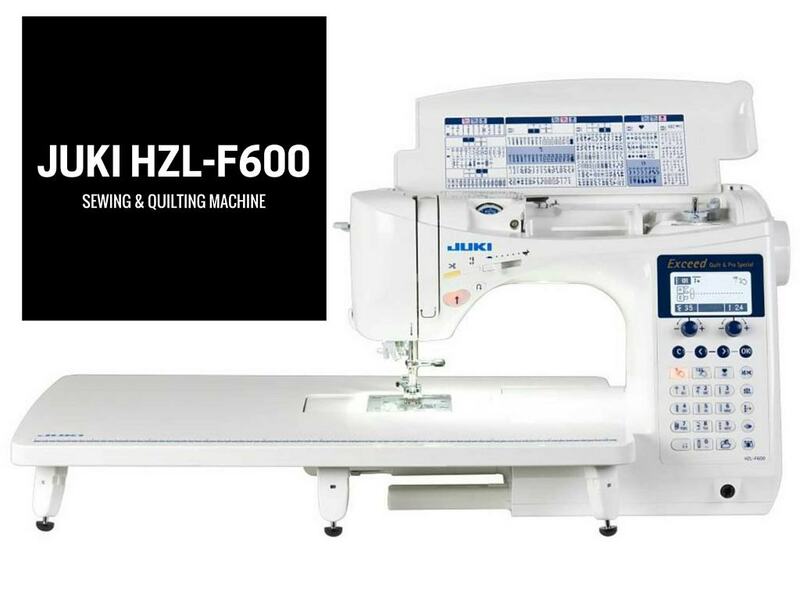 If you do a lot of daily sewing and a whole lot more of quilting and other sewing projects that require industrial strength performance, you really can’t go wrong with the Juki HZL-F600 . I’ve just discovered your website. I’m enjoying it. I’ve sewn for 53 years. I’ve sewn costumes, prom dresses, bags, and a multitude of other projects. My current Brother XL 5130 is giving me problems. The thread gets caught in the inner mechanism. I’ve haven’t been happy with it’s ability to sew heavy duty projects. And now with this new problem, I’m totally frustrated with it. The upshot is, I’m looking for a reliable machine that can sew heavy duty projects and light delicate projects. I’ve always dreamed of a top of the line machine, but, as a retired librarian, my budget doesn’t contain enough money for a $3000 – $6000 machine. I’m limited to about $400.00. Of all the machines you’ve tested, which would be your favorite choice of the heavy duty or industrial machines, given my projects I’ve described to you. You are correct that $400 isn’t quite enough to spend on a true heavy duty machine, however I’m not sure that you need one based on the projects you mentioned. You might be able to get away with a really good quality sewing machine like the Singer One Plus or the Janome Magnolia 7330 . They are both really nice machine, are under $400 and can handle a lot. I hope that helps.